This issue of Radical Teacher focuses on why we should teach courses and collaborate with students in research in Critical University Studies (CUS)— a handy label, but please take “university” as a stand-in for many kinds of post-secondary institutions. This interdisciplinary endeavor employs history, sociology, economics, and political science to analyze the ways higher education is being shaped by larger cultural forces. One of the historical ironies examined here is that as the public university grows in importance, its support and funding are downsized. This trend forces us to ask how we can educate people in an unequal society and what role universities play in reinforcing the ideological myths that naturalize and rationalize the political and economic status quo. As Christopher Newfield has shown in Unmaking the Public University, higher education has been shaped by the politics of austerity and by changes in national demographics. According to Newfield’s narrative, at the same time more people of color entered into public universities, a tax revolt led to a defunding of these institutions. Then, in order to make up for a loss of state support, these schools had to turn away from their public missions and seek private support for research and other activities. Thus, due in part to the ideology of neoliberalism, the reduction of public funding for higher education was coupled with a more general retreat from welfare state policies and a turn to the free market as the supposed solution to all social and economic problems. Jeffrey Williams, another leading scholar in Critical University Studies, argues that we now have a Post-Welfare State university system shaped by reduced state funding and a massive increase in student debt. Moreover, as both Newfield and Williams point out, the more students are forced to take on the burden for paying for college, the more a public good is seen as a private good. Since many people now believe that the main reason to pursue a college degree is to get a good job in the future, they do not think they should have to support other people in the competition for a dwindling number of high-paying positions. The neoliberal university represents both this privatization of public institutions and the use of public funds by private institutions. As Suzanne Mettler illustrates in Degrees of Inequality, private for-profit colleges are now receiving most of their support from federal loans and grants, and so as the publics become more private, the privates become more public. Mettler also emphasizes that both private and public universities are no longer providing social mobility or decreasing economic inequality; instead, higher education now tends to increase social stratification. Due to the way that we fund and rank schools, wealthy students on average go to wealthy institutions with high graduation rates, while low-income students often go to low-funded schools with low graduation rates. Furthermore, as our society becomes more unequal, all levels of education also become more stratified. Most people—including students—still want to believe we have a meritocracy that rewards people for their talent and hard work in an equal manner; however, as we know from research on SAT tests, high scores and school achievement are highly correlated with family wealth, and so this meritocratic test works to support an aristocratic system. In this combination of aristocracy and meritocracy, one can understand the central conflict of the contemporary university as a battle between hierarchy and equality: universities often want to be highly rated, so they admit the students with the highest SAT scores, but these same schools want to be seen as open, democratic, and unprejudiced. Exploring this disturbing contradiction with students is an important task for CUS. According to Bill Readings’s The University in Ruins, the fight between hierarchy and equality has been smoothed over by focusing attention on excellence as a universal marker of value that has no real value in itself; globalization and the spread of market capitalism have resulted in a situation where universities no longer have a national or cultural mission; the values of higher education are fused into the cash-nexus of global capital through a discourse of empty excellence (3). Universities want to be excellent in all things in the same way. Readings, an early leader in CUS, goes as far as saying that Americanization means the end of national culture, and this loss of cultural identity undermines the social role of the university. Thus, a Critical University Studies approach has to look at how society and history affect institutions of higher education, and how these same institutions affect society. Readings echoed Robert Nisbet’s much earlier The Degradation of Academic Dogma, which traced the undermining of the public university to the flood of governmental money that poured into these institutions after World War II. Nisbet held that when the federal government increased its support for research, many professors turned away from teaching and the work of their departments, realizing that they could increase their pay and prestige in that way. If we accept this explanation we can locate the central cause of the degradation of instruction and corresponding casualization of the academic labor force in a tacit collusion of federal government and careerist researchers. Whichever narrative one chooses, and whatever additional forces one includes in the mix (the “culture wars” on post-1960s theory and curriculum; the 1970s fiscal crisis of the state; etc. ), clearly universities have been shaped by both internal and external social forces. Thus, a Critical University Studies approach has to look at how society and history affect institutions of higher education, and how these same institutions affect society. For example, the casualization of the academic labor force is not only the result of following broad, neoliberal economic imperatives; universities have themselves been innovators in developing new forms of de-professionalization and just-in-time labor practices. We often fail to see this role higher education is playing in neoliberalism because we believe in the myth that universities are progressive, liberal institutions. While it is difficult to specify a precise origin for Critical University Studies, and while there have been many critical books about the higher learning in America, going all the way back to Veblen, the project of consolidating this discourse and self-consciously developing a new discipline around it has gained momentum chiefly since the Great Recession. One of the challenges for CUS is that it’s hard to imagine universities and colleges creating and funding departments in this area. After all, much of this critical work challenges the self-presentation of these institutions and their traditional ways of teaching and researching. It is unlikely that we will soon see a Department of Critical University Studies, but we are witnessing instead a production of scholarship and practices that resist traditional university structures. It is our hope that this special issue will open a conversation about how and why we should take part in the endeavor. To help our students understand the political economy of knowledge production inside and outside of the academy, it is also vital to think about what pedagogical methods are most likely to engage students in these issues and help them think past their resistance to learning new and often upsetting things about higher education. 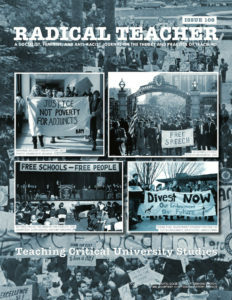 An essential argument the authors in this special cluster of Radical Teacher make or take as a premise is that Critical University Studies should not be just another area of academic research; it is important also to focus also on teaching, on how to close the gap between research and instruction at colleges and universities. In fact, an important claim of much of this work is that all research and teaching is shaped by political, cultural, economic, and historical forces, but we often teach and publish knowledge as if it is divorced from political and economic concerns. For instance, students rarely understand the academic labor system and how the reliance on contingent faculty affects their education. They also are not aware of how the external grant funding system can shape what is taught; instead, knowledge, especially in the sciences, is usually communicated as if it is without context. The role of capitalism and political ideology, then, in shaping who teaches and what is taught is hidden from view. To help our students understand the political economy of knowledge production inside and outside of the academy, it is also vital to think about what pedagogical methods are most likely to engage students in these issues and help them think past their resistance to learning new and often upsetting things about higher education. It is not enough to present students with the facts or logical arguments; rather, we need multiple media and fresh pedagogies. All of the articles stress that Critical University Studies calls for new ways of teaching both inside and outside of the college classroom. As a self-reflexive discourse, the discipline pushes us to think about how we teach and research and the ways our work is always embedded in particular social, institutional, historical, and economic contexts. For example, in “Waking Yourself Up: The Liberatory Potential of Critical University Studies,” Mikaila Arthur and Scott Renshaw present their account as a dialogue between a professor and a student, describing a general education course that featured guest lectures by administrators, staff, and faculty. One of the goals of this class was to introduce students to the diverse jobs and roles shaping the school, but the inquiry began with students naming their own problems with and complaints about their educational experience. By commencing with the students, instead of the guest expert speakers, the professor set the students thinking in their own way about how their education was structured. Furthermore, the dialogical nature of the teaching pointed to a democratic model of education, and therefore challenged the traditional Introduction to the University course. When students got to question the administrators and other staff who made presentations to the class, they were thus engaged in a direct inquiry they had initiated, about matters affecting them on a daily basis. Another example of format matching content is Arthur Leigh Binford’s “Teaching the Adjunct Experience.” Binford structured this capstone research seminar for sociology and anthropology majors in four sections: 1) “readings, lectures, and discussions about globalization, Fordism and neoliberalism, and flexible and contingent work both outside and within higher education”; 2) the development of a survey of other students at the college on their knowledge about adjunct labor; 3) interviews of adjunct faculty members by students in the course; and 4) a final essay by each student. Students themselves became key researchers in Critical University Studies as they learned the methods and techniques of their own major field. Heather Steffen also focuses on students as researchers. But “Inventing Our University” takes CUS outside of the classroom, and shows how to build knowledge collaboratively, over a period of more than a semester. Steffen describes her ambitious project in this way: “Together, we are conducting a series of interviews with [University of California Santa Barbara] student workers, asking them about their jobs, career plans, educational experiences, finances, and how working affects their academic, social, and family lives. Our analysis of the interviews is qualitative and situated within critical university studies, student affairs, pedagogical studies, and public debates about higher education. As a project fusing research, writing, and social justice goals, we present our analyses in multiple modes: we are creating a website at www.allworkedup.org, writing in academic and public genres, attending conferences, facilitating workshops and community discussions, and collecting footage for a documentary film.” The project makes the work of students and faculty public and empowers students to be producers of research, not simply consumers of already produced knowledge. In the final part of her article, Steffen discusses how her group procured institutional funding, a nice example of how CUS can simultaneously critique the institution and take advantage of its resources and structures, transforming it from both inside and outside. Her work raises the difficult question of how to situate this new discourse in existing institutional structures. Stephen Brier’s “Why the History of CUNY Matters” offers another approach. We learn about the creation of a digital archive documenting the political and economic transformations of this important institution. As part of a doctoral course on the history of higher education, students engage with this online archive and produce their own contributions to it. Their final projects focus on “student, faculty, and/or staff activism; curricular innovations, local community input and struggles, or local or city-wide administrative and political action or inaction that encouraged or hampered institutional or pedagogical developments and transformations. The learning objective is for doctoral students to incorporate historical thinking and primary historical sources and methodologies into the ways they understand and write about the history of higher education.” As in the project at Santa Barbara, CUS helps students learn vital research skills as they learn about their own institution, and about the history and political economy of higher education. Douglas Schuler offers still another example of engaged student-faculty research, in “What do we rank when we rank colleges? Who determines how and who benefits? Student empowerment and the development of alternative college rankings.” Here he describes working with students over more than one academic year to develop a system for ranking colleges that is based on fostering “civic intelligence,” and that contrasts sharply with influential schemes such as that of U.S. News and World Report. This project allowed students to concentrate on an educational value that is a commitment of their own institution, Evergreen State College, and that can be set against the values that drive conventional ratings: prestige, selectivity, economic payoffs, and so on. All our authors would probably agree that Critical University Studies can be at once a subversive activity and an effort to promote positive social change and active student engagement. Christopher Newfield. Unmaking the public university: The forty-year assault on the middle class. Harvard University Press, 2008. Williams, Jeffrey J. “The post-welfare state university.” American Literary History 18.1 (2006): 190-216. Mettler, Suzanne. Degrees of inequality: How the politics of higher education sabotaged the American dream. Basic Books, 2014. Readings, Bill. The university in ruins. Harvard University Press, 1996. Nisbet, Robert A. The degradation of the academic dogma. Transaction Publishers, 1971.